2017 has been an active year for American Cart. There’s been new carts introduced and an updated catalog! Here are some of the latest developments and promotions from American Cart! The latest American Cart Catalog features updated product photos and information. Also included are some of the newest products from American Cart. Updated Specs – Weights and dimensions have been revised. 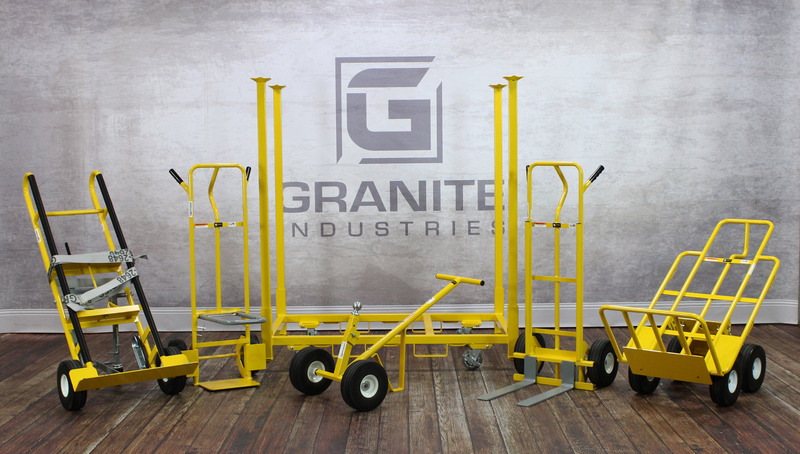 Keep your hoses stacked neatly and safely with Granite’s hose cart storage rack. The channeled center pan allows the rolled hose to rest in a vertical position and stacked side by side. Four locking 8″ swivel casters that allow for easy rolling. Built in tow motor pockets for easy lifting and stacking. Tent stake storage can be quite the issue for many tent rental companies. The Tent Stake Rack from American Cart is designed to tackle that exact issue. We took input from the tent industry and put together a solution that maximizes storage and versatility. Built from the ground up on an all-steel chassis, the carts are built to withstand over 100 tent stakes (2 inch heads, 24 inches long, 10 lbs each). Easily load tent stakes in the cart, alternating end for end. E-ratchet strap brackets are built into the cart. This adds another level of security to the load and can aid in quicker loading and unloading. E-Track ratchet straps are not included with the cart but can easily be added. Optional rolling base improves rack maneuverability. Fork lifts can easily get its forks under the unit to make the units easily transportable in a warehouse.